April 2, 2019 By Eugene Nielsen & filed under All Articles, Essentials, Gear. CLENS applies easily to lens of weaponlight or flashlight. It is optically clear and does not affect light output or beam pattern. If you shoot a lot with a weaponlight attached to your firearm, you have encountered an annoying problem: Carbon buildup from muzzle blast eventually begins to fog up the lens. With today’s higher-output weaponlights, it’s not as much of a problem as it was in the past, but it does still happen. After as little as a box of ammo, the lumen output can be significantly degraded. If you shoot during the day, you may not notice the buildup until you try to use your weaponlight at night or in a low-light scenario. In addition to degrading output, the buildup can degrade and discolor the lens over time. It’s also time-consuming and a pain to clean off completely. 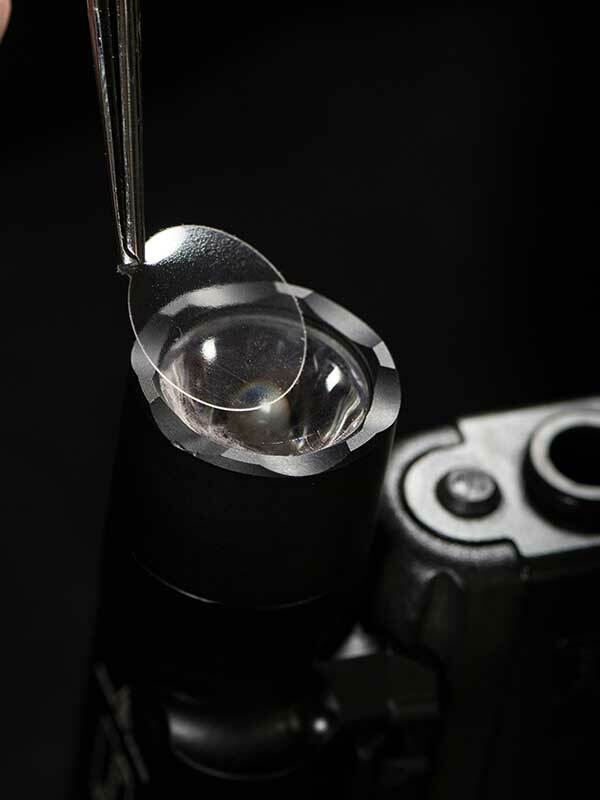 Improvised solutions have been employed in an attempt to mitigate the problem, including taping up the lens or wiping gun oil, Vaseline®, or lip balm on the lens. All of these methods leave much to be desired. CLENS protectors are pre-cut. Simply remove one from the sheet and apply it to the light’s lens. 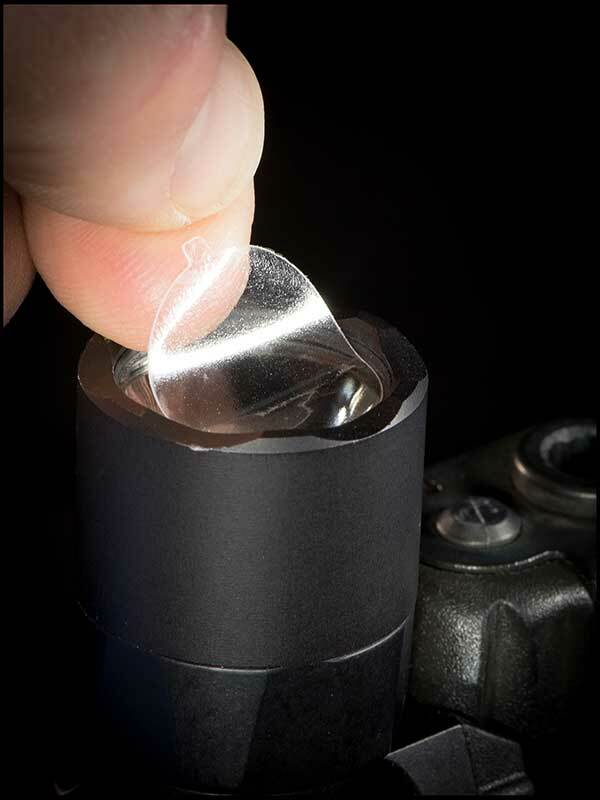 CLENS is a heat-resistant clear-polymer circular tear-off lens protector for weaponlights and tactical flashlights. It has its genesis in the tear-off visor and goggle protectors used by off-road racers. Once the CLENS becomes fouled, simply peel it off and replace it with another CLENS protector. There is no risk of damage to the lens, as would be the case if using abrasive lens cleaners. It’s a very simple and cost-effective solution. Not only does it protect your light, but it also lets you clean the lens more effortlessly. CLENS is designed to be durable and not to be blown off by the muzzle blast from a muzzle brake. During the prototype phase, the developers utilized many different materials and thicknesses to determine a design that (within reason) was going to stay affixed to the lens. The resulting design has withstood thousands of rounds fired. CLENS sheets come in three sizes and in assorted sheet of 12 lens protectors that includes all three sizes to fit a wide variety of weaponlights and tactical flashlight lenses. Small fits SureFire® X300U and SureFire Scout Lights®. Medium fits SureFire Fury® and SureFire Intellibeam® flashlights and Streamlight® Protac HL and HL-X. Large fits the SureFire G2X and SureFire 6PX and Streamlight Strion®. The listed lights are only those that Thyrm has tested CLENS on for compatibility. CLENS will fit other similarly sized lenses. 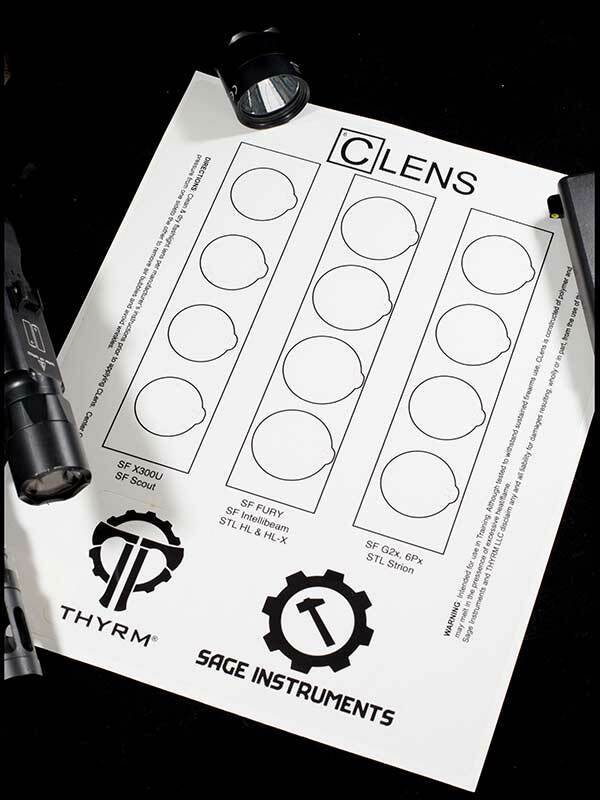 To apply the CLENS, first clean and dry your weaponlight or tactical flashlight lens per the manufacturer’s instructions. Peel off the appropriately sized CLENS from the sheet. Center and apply it to the lens, applying pressure from one side to the other to remove air bubbles and wrinkles. 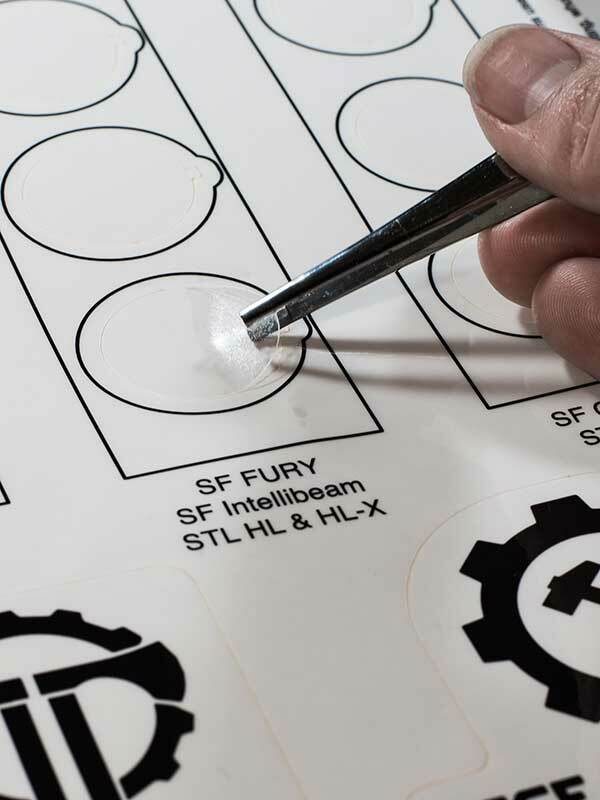 CLENS is a mild adhesive-backed, heat-resistant clear polymer circle that protects the lens from carbon and other debris that can build up from the use of lights during firearms training. When the CLENS becomes fouled, just peel it off the lens. The mild adhesive on the CLENS is designed to securely attach the CLENS yet leave no residue on a clean or undamaged lens. The adhesive may stick to a dirty or damaged lens, but if this occurs, touching the sticky side of the CLENS to any residual adhesive should remove it from the lens. Although designed for training, CLENS has obvious tactical applications in the field to protect the lens not only from carbon fouling but from dirt and debris as well. Thyrm does caution that “although designed to withstand sustained firearms use, CLENS is constructed of polymer and may melt in the presence of excessive heat/flame.” This won’t occur with normal use, including high-round-count training and real-world scenarios. CLENS is a great product and a solution to a very real problem. Each CLENS sheet is priced at $8.99 and available directly from Thyrm.